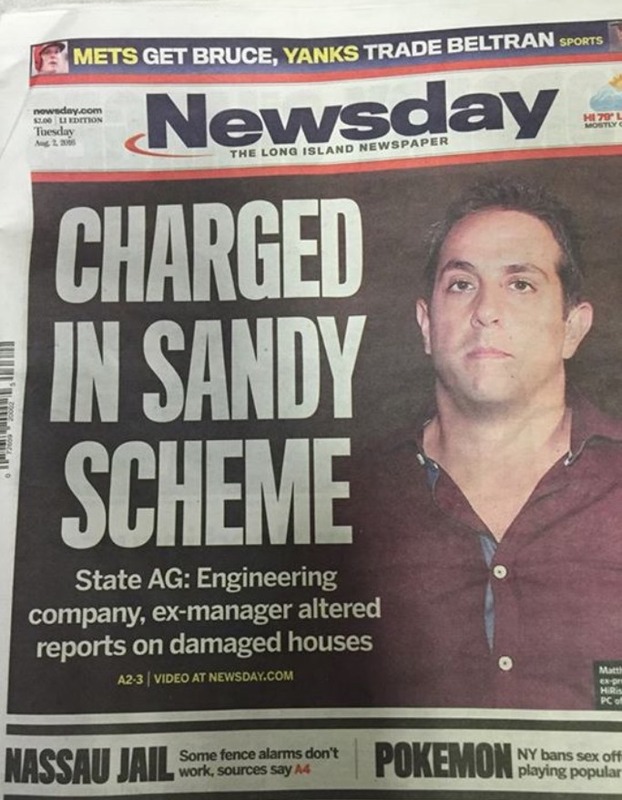 A Long Island engineering company and one of its former executives were charged on Monday in a scheme to minimize insurance payments to homeowners whose residences were damaged by Hurricane Sandy in 2012. The full Indictment is available here. I reckon Nielsen and the rest of the gang has got a sharp eye peeled on this latest turn of events. After Katrina the DoJ, then under President Bushie, preferred not to take on any large campaign contributors insurance companies, even if they defrauded the taxpayers. That really has not changed under Obama with the development of the twin legal theories in “too big to fail” and “too big to jail” so the New York AG’s referral of other potential criminal acts to the US DoJ is certain to die on the vine. Speaking of Nielsen and the gang, scorched earth litigation tactics did not shake our own Magnum off the trail, which was relatively easy to follow based on the experiences of those with insurance claims after Hurricane Katrina. Magnum ended up scoring a TKO. To fix the flood program would mean also stopping the politically connected from gaming the system via property removal from the floodplain despite it clearly belonging in the floodplain. There are a lot of vultures on top of that particular pile of taxpayer money. Finally they may have been 10 years late to the party but now the New York Times via reporter David Chen has now fully engaged the issue. Paige St John won a Pulitzer tackling the twisted money trail behinds the systematic looting of the NFIP. With far more resources available to Chen it would be nice to see the NYT follow in her footsteps. NY AG office can press criminal charges. Most other State AGs can only go for civil penalties. It makes the NY AG a very dangerous beast to tangle with.